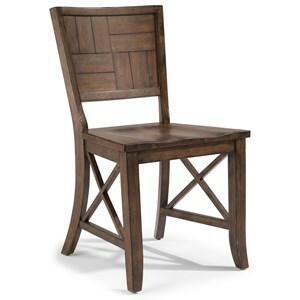 Crafted from solid acacia and reclaimed wood, this counter chair exudes rustic style. Tapered legs and clean lines suggest casual style, while the X detailing alludes to industrial design. 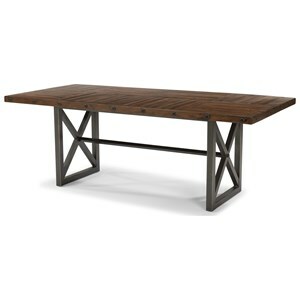 A Rustic Amber finish completes the piece, creating chocolatey tones that bring a sense of warmth to any dining space. 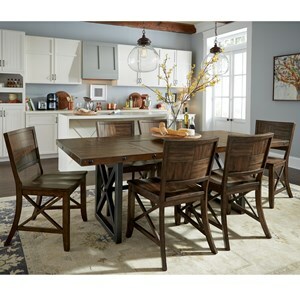 The Carpenter Counter Chair with X Detail by Flexsteel Wynwood Collection at Powell's Furniture and Mattress in the Fredericksburg, Richmond, Charlottesville, Virginia and Maryland area. Product availability may vary. Contact us for the most current availability on this product. Finish Rustic Amber wood finish. Offering adjustable tables and rugged industrial design elements, the Carpenter dining collection promises versatility and style. Acacia solids and reclaimed wood give each piece a unique weathered look and feel, enhanced by the Rustic Amber finish. 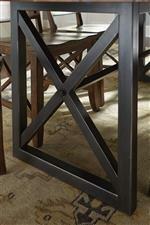 Metal bases with X detailing exude industrial style, providing a great focal point. Each table includes leg extenders that allow you to easily switch between standard and counter height dining for truly versatile dining. 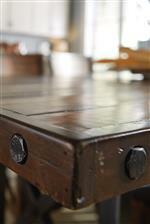 The Carpenter collection is a great option if you are looking for Rustic Industrial furniture in the Fredericksburg, Richmond, Charlottesville, Virginia and Maryland area. Browse other items in the Carpenter collection from Powell's Furniture and Mattress in the Fredericksburg, Richmond, Charlottesville, Virginia and Maryland area.